If you read my blog even semi-regularly, you undoubtedly know that I have two struggling readers. Boys. Ages 10 and 12. One isn't struggling nearly as much anymore, however I still classify him as struggling. Struggling reader: may or may not *want* to read, but has a tough time in the actual process of reading at/near grade level. In my sons' cases, they do fairly well with much, much easier materials, so they *can* read. They just struggle with material at "their" grade level. Reluctant reader: it isn't that he can't read, it is that he doesn't want to. I think sometimes a young reluctant reader may be a struggling reader waiting to happen -- he is doing okay with the lower level materials because he is compensating, but when the reading gets more challenging (typically about 3rd grade) those coping strategies will break down. There is a lot of overlap in the categories. I always thought my brothers were reluctant readers, but now in looking back, I really wonder if they weren't struggling readers masking their issues by proclaiming that reading is boring. If you have either type of reader, though, one thing that can really help is to find books those kids will find interesting. And preferably appropriate. Unfortunately, as a mom of struggling boys, that has truly been a challenge. In three or four years of searching, I have found very, very few series out there that have any boy appeal at all. I have not been alone in that. In 2007, Marianne Hering had a son who was a struggling reader. A son who needed to practice a lot more in that easy reader stage. Paul McCusker had a son about the same age as Hering's twin boys, and they both recognized that there just wasn't much out there, particularly in the Christian market, for BOYS. 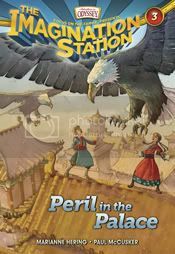 They teamed up, and today there is a series based on Adventures in Odyssey's Imagination Station that has strong appeal for both boys and girls and it promotes historical fiction. Currently there are four books in the series, with more coming. Twelve books are planned, and I have to confess, I cried when I heard that. I own all four, and my boys love them. Connor (my non-struggling teenager) has read them all. I think he read all four in an afternoon. For a strong reader, these are a pretty quick read. He found them interesting enough to spend that time though. He wants to read more, and was very enthusiastic about how these are fantastic books for his brothers because they have strong Christian content without being preachy, and lots of great action. William, age 12, is making far slower progress. But these are books he *wants* to read. Lots of action, heading to places we've studied in history. These books are FUN. Thomas, age 10, has not started reading these yet. Partially because I think he could get through them faster than William, partially because he has been reading something else to me and I'm making him finish that first. Basic overview: Cousins Beth and Patrick travel back in time through the Imagination Station to try to save a relative of Mr. Whittaker's named Albert. Basically, each book starts off with a note sending them off on a quest in time. They head back to whichever point necessary, and adventure ensues. They find what they were sent to find and head back (hopefully) to Odyssey... only to find there is another adventure around the corner as the quest to save Albert continues. Peril in the Palace takes place in 1271 in China. The quest is to find the golden tablet of Kublai Khan. Adventure ensues -- Mongol warriors, saved by Marco Polo, imprisoned by Kublai Khan, Arab invaders, giant eagles. Lots of amazing conversation (based on historical records) in the court of the Kahn. Revenge of the Red Knight takes place in the Middle Ages, around 1450 in England, and the cousins finally get to meet Albert. They get mixed up in all kinds of shenanigans there, pretty much what you would expect for the time period -- castles, dungeons, and jousts. 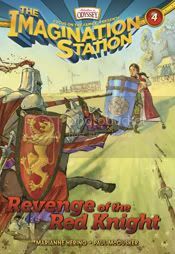 This book leans further towards the "fiction" end of "historical fiction" than the previous books do, but still... it occurs during the War of the Roses, and touches on the Crusades. Fabulous books. I cannot recommend them highly enough. I cannot wait to get my hands on Showdown with the Shepherd (book 5) and Problems in Plymouth (book 6). And... I have a set to give away. This is for US and Canadian addresses only, please. To enter, you merely have to leave a comment telling me why you are interested in these books. Post about this giveaway on your blog, on Facebook, etc. Leave a separate entry for each way you post, linking if possible. This giveaway will end July 15, at or shortly after 11:59 pm Mountain Time. I will use random.org to select a winner. I will email the winner and if I do not hear back, I will draw a new winner on Monday. So please, make sure I can contact you! I wonder if my struggling reader would enjoy these? I'd love to try them! My struggling/reluctant reader likes to write songs. I'd love to have these books for Brennan -- I'm not sure if he's a reluctant reader, a struggling reader, or just picky. I follow w/ Networked Blogs. Like I said, I'm not sure if Brennan is struggling or reluctant, but I have a hard time finding books that will really engage him. Some of his favorites are by Andrew Clements, especially A Week in the Woods. I'm always looking for new books for my girls to read, these look like great fun! What a lovely give-away! I haven't read any of these books to my children although we do enjoy the Adventure in Odyssse stories while we are traveling in the car. I only have two readers in the family so far. My oldest is way above level. My son is a reluctant reader at this season. I am praying that something will catch his interest to get him to soar. My son (age 12) is a great reader but doesn't particularly enjoy reading on his own. He prefers I read to him. But I'm always on the lookout for books he will read himself. These look great!! I've been wanting this series for my daughter! I'd love to read these books aloud to my boys. They are emerging readers, but they have the attention for longer titles. I enjoy snuggling up and reading aloud to them. I've been reading reviews of this series - sounds great! I'm now following on Networked Blogs.